Love Beads have been popular since the 60's and signify peace and love. They were typically given away to someone you connected with to promote a sense of unity. One Meaning Love Beads are simultaneously retro and modern, something we call hippie chic. These pretty beaded pieces are handmade exclusively for us in NYC using glass beads. All come with a little One Meaning Butterfly charm, our butterfly made of 813, which means “I love you”...8 letters, 3 words, 1 meaning. The 1 is in the middle because love is the center of everything.® Enjoy your beautiful Love Beads on their own, or layer them with other pieces from our meaningful collection to make your own personal style shine through. Available in several versions - scroll down to view. Peace. Hippie Chic at its best...A slightly thicker bracelet with 9 rows of vividly colored beads and a double gold tone chain trim in a unique design. One chain is hand sewn tightly to the bracelet as a trim and the other is attached at the closures only so that it falls gracefully with the movement of your hand. One Meaning Love Beads are handmade exclusively for us in NYC using shimmering and matte glass beads. Beautifully layers with your favorite bracelets. Shown here with our "I Love You" Leather Wrap, our classic Love Beads, and a Wish Wink! Comes with a brass charm of our meaningful 813 Butterfly that means I love you. All are adjustable. Bohemian, colorful, chic and perfect for stacking. Our Go Native collection is a nod to a classic Native American patterns. Named after the elements. One Meaning Love Beads are handmade exclusively for us in NYC using shimmering and matte glass beads. Comes with a brass charm of our meaningful 813 Butterfly that means I love you. All are adjustable. Fire - Vibrant tones of blue, pink, coral, and yellow. 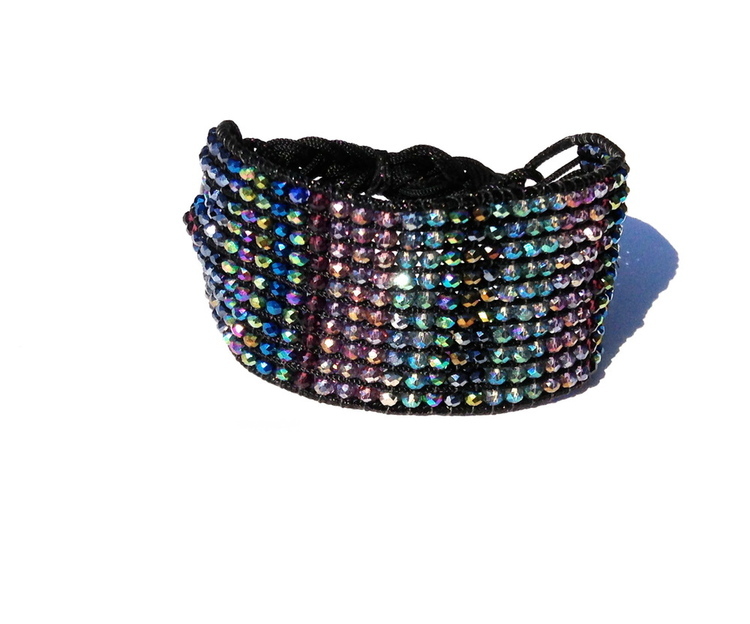 Choose the "Extra Bling" option if you'd like the version with two rows of Swarovski crystals. Shown here with our "I Love You" Leather Wrap, our classic Love Beads, and a Wish Wink! Sporty, luxurious, meaningful. These aren't your mama's Love Beads. One Meaning's are handmade exclusively for us in NYC using gorgeous glass beads with a distinctive shimmer and a pattern that is reminiscent of a rich ribbon. Available in tones of beige, cream, a hint of deep peacock green and your choice of gold or silver tone beads, with a brass or silver charm that has our "I love you" Butterfly. These are very special. All are adjustable. The rainbow pattern in our Unity Love Bead bracelet is a sign of diversity, inclusiveness, and hope. Handmade exclusively for One Meaning in NYC using gorgeous glass beads with a light catching shimmer. Wear it to show your love and support of our LGBT family and friends and to spread the message of love and peace. One Meaning is a staunch supporter of tolerance and equality for all - it is the key to harmony. Peace, man. All are adjustable. Super glam statement piece with meaning. This luxurious version is handmade exclusively for us in NYC using gorgeous glass beads with a distinctive shimmer and a pattern that is reminiscent of an iridescent dragonfly wing, with either a brass or silver charm that means "I love you." Who says being a modern day Hippie means you can't glam it up! All are adjustable. If you love One Meaning Love Beads, you might be a Hippie or well on your way to becoming one. Congratulations! Need some inspiration to make your transition? Here's a "How to be a Hippie" checklist.